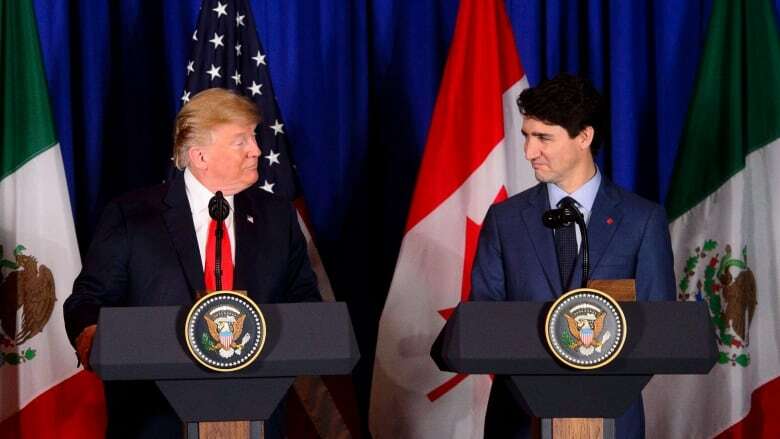 The Trudeau government quietly started its ratification process for the revised North American trade agreement Wednesday. Implementation legislation for the Canada-U.S.-Mexico Agreement can now follow early in 2019. The Trudeau government quietly started its ratification process for the revised North American trade agreement Wednesday. Andrew Leslie, the parliamentary secretary for Foreign Affairs Minister Chrystia Freeland, tabled the full text of the Canada-U.S.-Mexico Agreement after question period Wednesday. Prime Minister Justin Trudeau signed the final, legally-vetted version of the trade deal in Buenos Aires, Argentina on Nov. 30 with U.S. President Donald Trump and then-Mexican president Enrique Pena Nieto. For a trade treaty like this, the government is required to table the text in the House of Commons before proceeding with ratification. Wednesday's tabling starts the clock on a parliamentary requirement: 21 full sitting days before implementing legislation is introduced to change laws and regulations to comply with the new agreement. Parliament is expected to rise this week for its holiday recess, returning Jan. 28. That means the earliest an implementation bill could land is late March. In Canada, the federal cabinet ratifies trade treaties. But Parliament has a chance to debate the implementation bill and must pass it before ratification can be finalized. No specific deadline has been set for this ratification. All three countries will need to agree on a date for the deal to take effect. In the U.S., the ratification process is expected to be challenging, following the election of a Democratic majority in the House of Representatives last November. Prominent Democrats in Congress have voiced concerns about the new deal negotiated by the Trump administration and appear willing to pick fights with Trump in the new year. In addition to measures expected in the implementation bill, cabinet may have to issue other orders to change regulations to bring Canada into compliance with the new agreement. Several outstanding issues need to be sorted out before the revised NAFTA takes effect. For example, a working group formed to discuss compensation for Canada's dairy sector is only just getting started.